I was six years old and I was doing what I loved best. I was watching the Yankees take on the Twins in the Humbert H. Humphrey Metrodome. We were fortunate to be able to make this trip often. Somewhere in the middle of the game my dad reached over to me and asked me to step a few rows down and ask a certain gentleman for his autograph. Being the lovely and abiding son that I was, I obliged to his request. Pretty cool huh? Well actually he never did call me. I never put on the Yankee uniform and I never stepped out onto the famous grounds of Yankee Stadium. It would have been a dream come true for me to one day play for the Yankees or to step foot on the field wearing the Yankee jersey. In reality, I had many dreams as a kid as I’m sure you did as well. When I was in grade school, I dreamed of playing professional basketball. I played basketball in my driveway pretending I was the next Michael Jordan. I attended camp after camp. The first and last thing I did every day was shoot baskets. In all honesty, I slept with a basketball. The dream was real in my mind and it gave me a great deal of purpose in my childhood. I really got to thinking about all of this, over the past weekend. I took my two boys to the Yankees and Twins games in Minneapolis. I just remember how special these trips were to me and I wanted that same thing for my boys. On Friday afternoon before the game we were able to take a tour of Target Field. It was an awesome experience. At one point in time, I snapped the photo below. Tayten (7) on left. 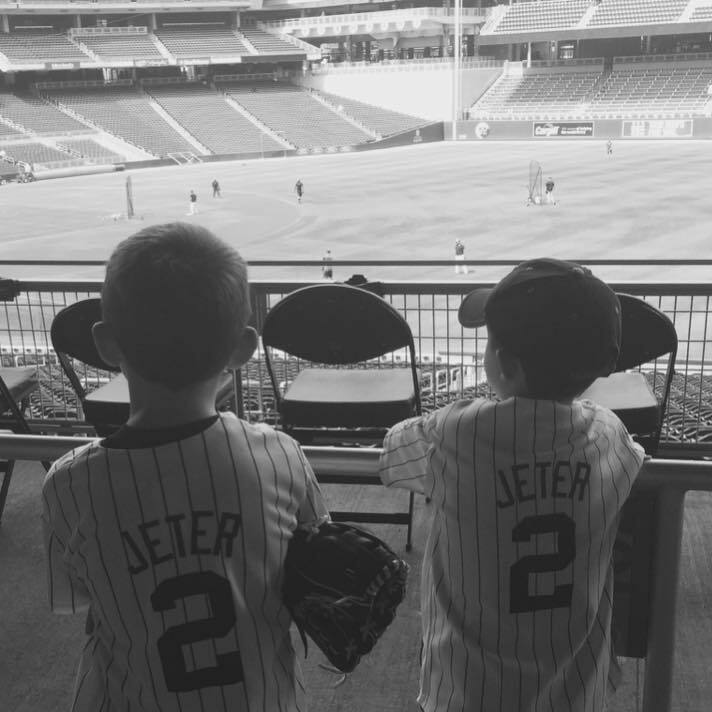 Jeter (5) on right. This picture reminds me so much of my childhood. I knew the feeling that was going through them as they looked out over the field. I felt that same thing years ago. We eventually were able to get close to the Yankee dugout and obtain a few autographs. The kids were on cloud 9. Tayten later told me, that when he’s out on the field he will throw me a ball and sign an autograph for me. I knew at that moment that a dream was brewing in his heart. The moral of all of this is that dreams are vitally important to our children. No matter how big the dream is, we need to encourage our kids. I know that my children drive me crazy from time to time, but that is what they are supposed to do. I know this because this is what my mother told me. No matter the circumstance we need to fuel the dreams of our children. We need to let them experience setbacks. We need to guide them and encourage them, but not necessarily point the way. I’m a big fan of the GPS and compass analogy. Rather than giving our kids a GPS which shows them the way, give them a compass and let them find their own way. But don’t be a dream killer. Don’t knock their dreams down, and (along that same token), don’t give up on your dreams. Who said you had to be a kid to dream? We all have dreams. Dreams drive us. Faith guides us. Fear nothing and give everything. You can. It’s that simple. Anything is possible. I will never be that parent that lives through his children, but I will be that parent that gives his kids every opportunity possible to experience life. It is through these opportunities that my children will be able to dream big and dream often. They may never get a call from the Yankees, and that is completely fine. But they will get a call someday. A dream will become a reality. No matter the shape or size of the dreams, some will become reality, while others not so much. Be there to celebrate those that become realities, and be there to provide support and guidance for those that don’t. Whatever you do, be a dream driver and not a dream killer. Don’t believe all the hype about grounding your children in reality. The reality is, they will learn and feel as they go. Just be a support. Love them unconditionally. Support your children in their dreams. If possible expose them to as many opportunities as possible.